I KNOW that Diego Costa has ruffled a few feathers in his time at Chelsea – he wasn’t labelled ‘The Angry Man’ for nothing. But he’s the best striker at Stamford Bridge and I don’t understand what manager Antonio Conte has against him. After the embarrassing opening day defeat to Burnley, Conte might regret sending Costa a text in the summer saying he was not part of his plans. That’s a chicken’s way out. Costa’s comments in the Daily Mail suggest there’s no way back. He feels as though he has been treated ‘like a criminal’. He wants to go back to Atletico Madrid and cannot understand why Chelsea, if they don’t want him, won’t let him go. Costa claims Conte has made him train with the reserves, which he refused to do. Something has clearly gone on behind the scenes between the player and manager. A clash of egos and temperament, perhaps? Two volatile characters colliding? Costa does not understand what he’s done wrong, but there’s clearly more to this than meets the eye. But Conte is doing himself no favours by alienating a player who has become a fans’ favourite. Costa agreed to grant an interview to Daily Mail reporter Adam Crafton at his family home in northern Brazil and opened his heart about the way he is being treated. 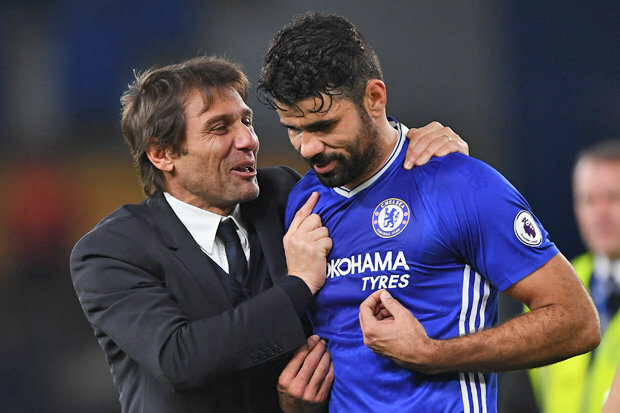 Expressing his desire to return to Atletico, Costa told Sportsmail – http://www.dailymail.co.uk/sport/football/article-4787112/DIEGO-COSTA-INTERVIEW-Chelsea-striker-talks-Sportsmail.html – that he wants Chelsea to bring an end to this sad and inexplicable saga. Conte should speak out and tell the truth too. Chelsea fans, as well as Costa, deserve that. He added: “’I am waiting for Chelsea to set me free. I didn’t want to leave. I was happy. But when the manager does not want you, you have to go. ‘If you were to ask all my teammates, they’d say the same. They send messages saying ‘I miss you’ and that they love me. The fans love him too and will be disappointed with the latest developments.